GE Osmonics Pentair TFM-24 RO Membrane is a 12" x 2" replacement cartridge providing 24 gallons per day of pure water and can fit RO systems that use standard Thin Film Composite Membranes(TFM/TFC). This GE Osmonics RO membrane reduces lead, mercury, chromium, nitrates and many other pollutants and contaminants. 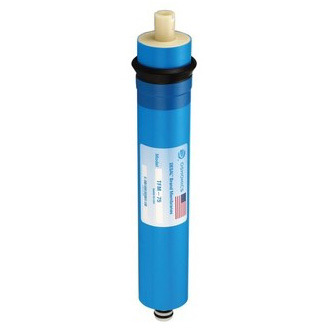 Primarily a residential class RO filter, the TFM-24 membrane can also handle commercial applications in restaurants, vending machines, pharmaceuticals, laboratories and electronics. Pentair TFM-24 is manufactured with "Membrane-Separation Technology" which employs crossflow filtration where captured impurities on the membrane are constantly swept away by the concentrate stream. Crossflow filtration across the membrane then divides the flow into two outflow streams: the cleansed permeate feed and the concentrate or reject stream. This flow provides continuous cleaning that prolongs membrane life and reducing maintenance costs. Membrane elements by GE are the brand of choice for most demanding applications. These elements deliver outstanding performance and long-lasting operation. 24 gallons per day capacity. Thin Film Composite Membrane for efficient purification. Cross compatible with other RO filter brands. ANSI/NSF 58 listed for performance. *Nominal performances are based on a 500 ppm softened tap at 65 psig (4.48 bar), 77°F (25°C), 15% recovery after 24 hours. Individual element flux may vary ± 15. ** Filters and membrane elements are not to be installed on microbiologically unsafe water supplies. Membrane Elements by GE are not certified to sanitize water, remove cysts, bacteria, or viruses. Filter and membrane element performance can be affected by fluctuations in water quality. Fits following Brands: PENTEK, U.S. Water ( US Water ), Culligan, Ametek, US Filter, American Plumber, Kinetico, Watts and models Lancaster - S1227, Marlo - PPCM 25. Want a US-made membrane? Opt for identical DOW Filmtec TW30-1812-24. - The GE Desal TFM-24 RO Membrane is not chlorine resistant. A chlorine taste and odor reduction water filter must be used before the RO membrane if chlorine is present in your water supply. - The DESAL-TFM-24 does not reduce fluoride. - The TFM Series Membrane Elements are Tested and Certified by NSF International against NSF/ANSI Standard 58 for material requirements only. Thanks again for you help in resolving this for me. A+ in customer satisfaction.